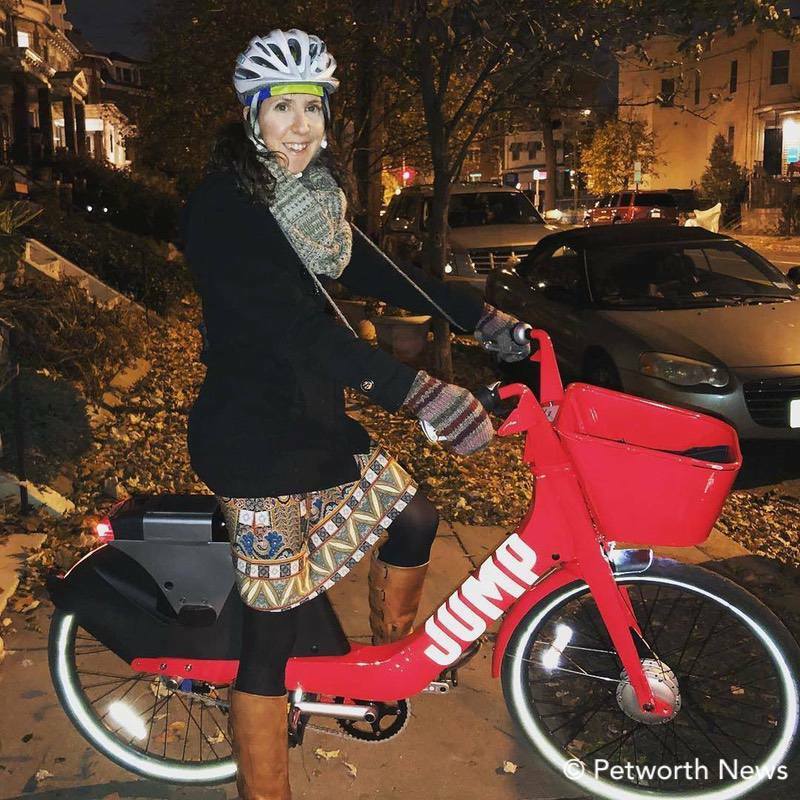 Rachel takes a test ride on a Jump Mobility ebike. You’ve seen them on the streets: bright red, green, yellow, orange and silver, and maybe parked on a sidewalk. They’re bright, shiny new, and some even have a bit of an oomph. They’re the talk of the town (or at least the bike community in DC). They’re dockless bikeshares. And DDOT is looking to hear your opinion on them. There's a survey at the bottom of this article where you can share your opinions. Bikeshares are systems where users rent bicycles for a short amount of time to get around town - commuting, running errands, riding to social activities, sightseeing, etc. Most trips are less than half an hour. Capital Bikeshare, the red bikes with docking stations you've seen for years, has been operating in DC since 2010 and is one of the oldest bikeshare systems in the country. Users purchase memberships (daily, monthly or annual), and pick up/return the bikes to docks throughout the city and surrounding area. The first 30 minutes of each ride is included in the membership and there’s a fee for rides longer than that. The system has also been offering $2 trips without membership since Metro’s SafeTrack initiative began. Capital Bikeshare is operated by DDOT in partnership with Arlington, Alexandria, Montgomery County, and Fairfax County. There are 3,700 bikes and 440 docking stations in the system. The dockless bikeshares are an experiment by the District Department of Transportation (DDOT) to see whether these new systems can expand the number of bikeshare bicycles in the city and provide two-wheel access to areas without Capital Bikeshare docks (like Upper Northwest). Unlike Capital Bikeshare bikes which need to be returned to a physical docking station, the dockless bikes can be left anywhere it’s legal to park a bike, and for most of the systems, don’t need to be locked to anything like a street sign or bike rack. The experiment is meant to enhance the DC’s bikeshare infrastructure and not to replace Capital Bikeshare. Mobike has been rapidly expanding across the globe, working with cities seeking to improve their urban environment through sustainable and smart transportation. As such, Washington D.C. was the obvious choice for Mobike’s launch in the U.S. The bikes feature non-puncture airless tires, a lightweight and anti-rust frame, durable disk brakes, three gears and auto-inspired five-spoke wheels. The headlights will never run out of electricity, as they light up from the energy produced through pedaling. LimeBike was founded on a simple premise: How do we ensure future generations will not only be able to live on a healthy planet, but actually thrive? LimeBike aims to provide a sustainable solution to the first and last mile transportation problem by helping people move around their cities in an affordable and convenient way while eliminating their carbon footprint. We are here to empower future generations to change their behavior so we can save this planet together. Spin is North America's leading stationless bikeshare company. We are transforming cities and campuses by offering an accessible, affordable, and environmentally-friendly form of personal mobility. Our fleet of orange-colored smart-bikes, each equipped with GPS, can be unlocked by scanning a QR code with our app. At the end of a ride, users can park Spin bikes wherever responsible. Spin works with city and campus officials to provide an affordable and equitable bikeshare with no public financing. Spin covers the cost of bikes and maintenance, and employs people from the local community for operations. With ofo, you pick up a bike, get where you're going, and leave it there. No docking stations, no walking the rest of the way. Because that's what a bike share is supposed to be. JUMP isn’t just better bike share, it is a game-changer: Cheaper than most public transit and faster than a car in city traffic. Our e-bikes are the most enjoyable and empowering way to get around DC. These bikes have it all: Integrated GPS, secure locking system, electric motor, the list goes on. Plus they look cool. The DDOT experiment runs through April 2018. We've figured we'd collect YOUR opinions about the bikes. Responses will be shared with DDOT (anonymously). Please let us know what you think!